» A Review by Mary Reed: MILES BURTON – The Secret of High Eldersham. A Review by Mary Reed: MILES BURTON – The Secret of High Eldersham. MILES BURTON – The Secret of High Eldersham. Collins, UK, hc, 1930. Mystery League, US, hc, 1931 (shown). 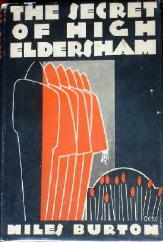 Also published as The Mystery of High Eldersham, Collins, UK, pb, 1933 (also shown). Retired Metropolitan Police sergeant Samuel Whitehead is landlord of the Rose and Crown public house in the East Anglian village of High Eldersham. Hitherto the pub has not been a paying concern but since Whitehead took over as mine host it has done well, despite the fact the locals are not the friendliest of folk and outsiders who take up residence in the village tend not to prosper. Then late one evening village bobby Constable Viney finds Whitehead murdered in the pub. Given the till has not been rifled, it seems robbery was not involved. What then could the motive have been? Chief Constable Bateman has hardly been on the scene five minutes, much less interviewed any of the villagers except Constable Viney, when he decides to call in Scotland Yard. Enter Detective-Inspector Robert Young of the Yard. Taking up residence at the Rose and Crown next day, he soon senses there is something, well, odd about the village and writes to his friend Desmond Merrion asking him to come to High Eldersham to discuss the case. My verdict: Alas, I found this entry in the Merrion series less entertaining than some of his other adventures. One secret of High Eldersham will leap out at the alert reader a few chapters before it is revealed by the author and the other telegraphs itself in similar fashion. In all fairness it is possible these matters were considered much more shocking at the time the book was published than nowadays. Questions such as the identity of the lady who shows up in the village in a Rolls Royce and why the publican was murdered and by whom are solved in a satisfactory manner, and there’s even romantic interest for Merrion. While generally slow-paced there are several gripping episodes, but to avoid spoilers their nature had best remain shrouded in thick fog rather than trumpeted forth in this short review. On balance, then, if I had to assign a grade, I’d mark it as a B.
I always enjoy Mary Reed’s reviews. And had similar mixed feelings about the uneven The Secret of High Eldersham. Best part: a subplot set on a river (Chapters 12-16). The British do this sort of nautical nature area to a T.
It’s too bad that as a mystery, both of you found the book uneven, since it’s one of the easier of Miles Burton’s detective novels to obtain as an actual physical book. It may be a moot point, since it’s available online as an e-text, but in the US it was published by Mystery League, which as I understand it, sold their books in dime stores by the thousands.